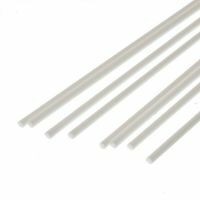 Home Scratchbuilding & Superdetailing Plastic Rod and Tube Evergreen Plastic Rod 1/16"
Evergreen White Plastic Rod. Each pack contains 8 lengths of rod, each 14" long. Circular section, 1/16" diameter (0.062" - 1.6mm).